Douglas Cavey | Launceston Then! 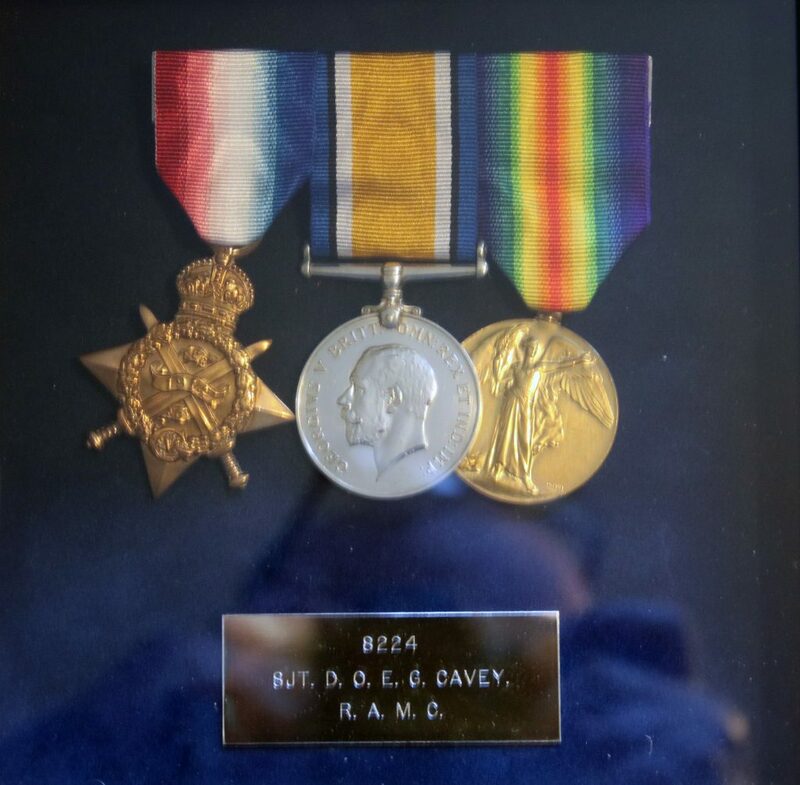 With thanks to Richard and Jean Cavey, Douglas’s grandson and granddaughter-in-law. 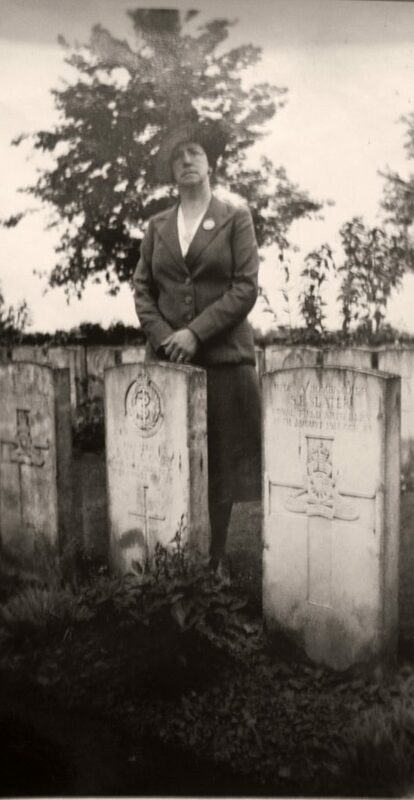 Douglas was born in 1890 at Race Hill, Launceston to William and Emma Cavey. His Father was the Caretaker at the Launceston Telephone Co. in 1911. In 1912 he married Gertrude Rice taking up residence at 5, Race Hill Terrace, Launceston. . 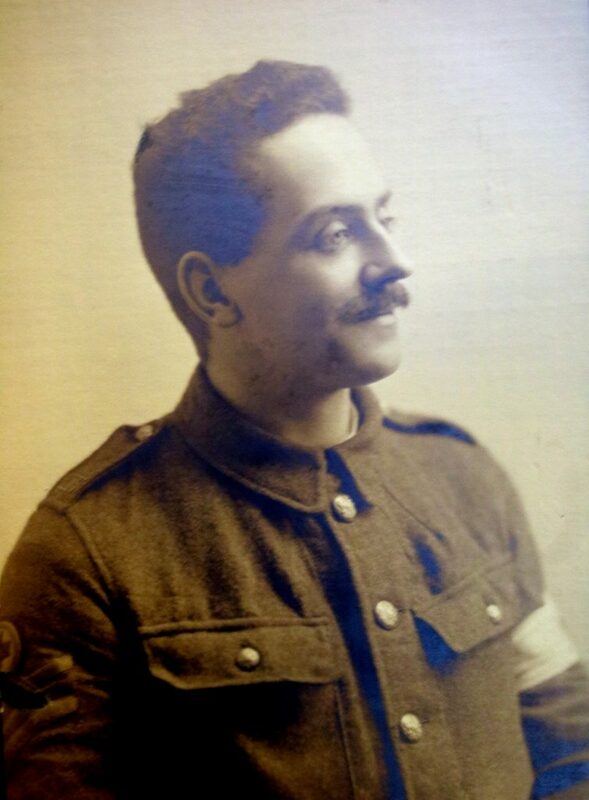 He was working for Doctor’s Thompson, Gibson and Budd as a Dispenser prior to enlisting in the Royal Army Medical Corps (Regimental No. 8224) in August 1914 at Devonport. 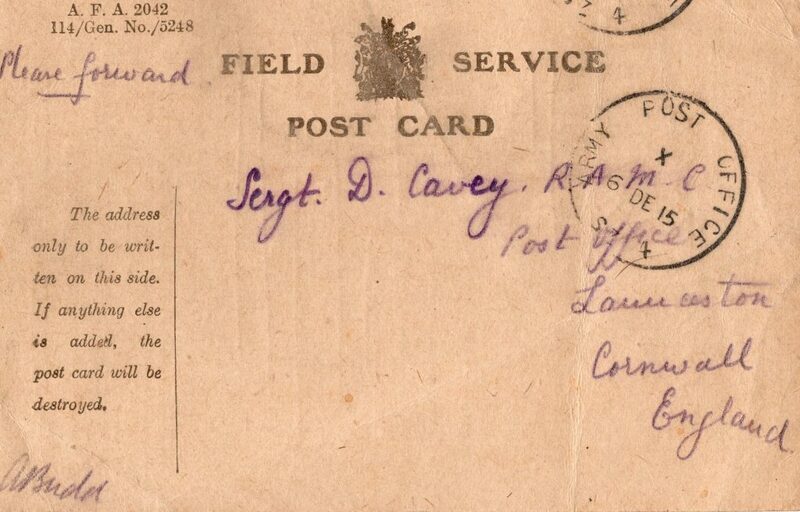 Arthur Budd’s Postcard to Doug Cavey November 1915. 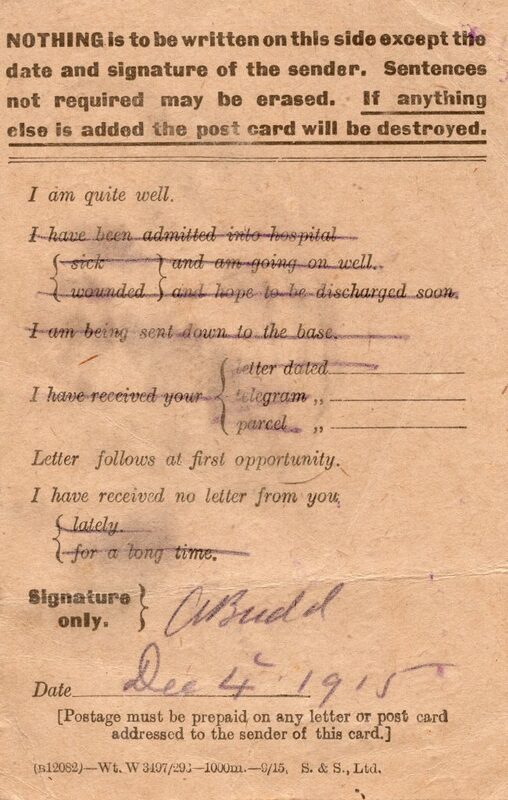 Doug prior to the war had worked for Dr. Budd at the Southgate Surgery. 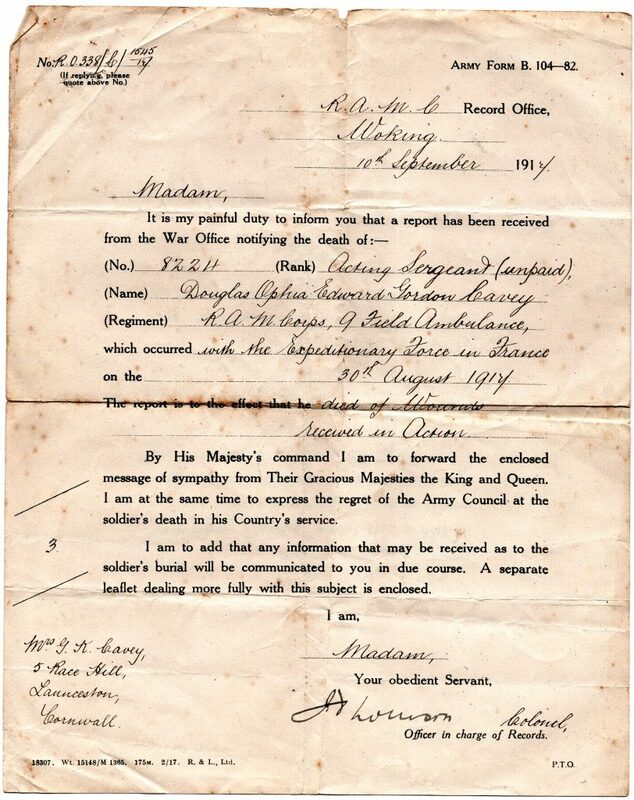 Doug Cavey letter receipt from Arthur Budd December 4th, 1915. 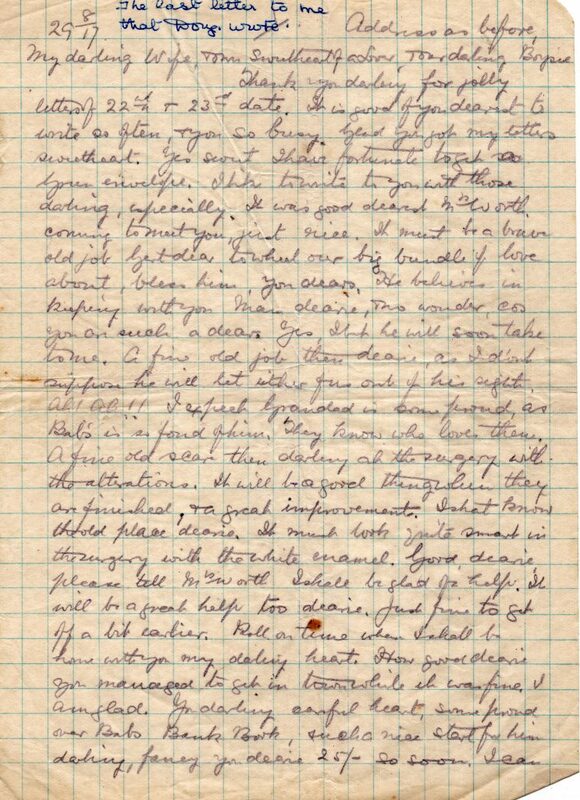 Doug Cavey’s last letter to his wife August 29th, 1917, page one. 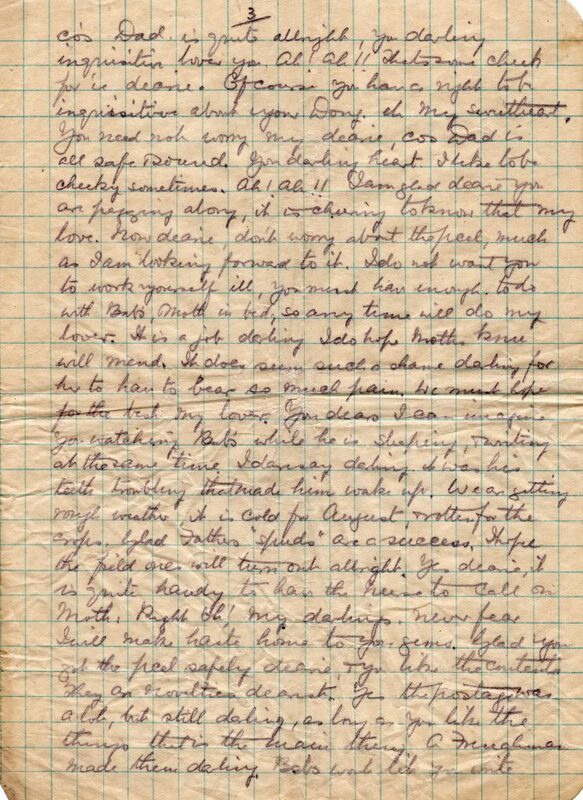 Doug Cavey’s last letter to his wife August 29th, 1917, page two. 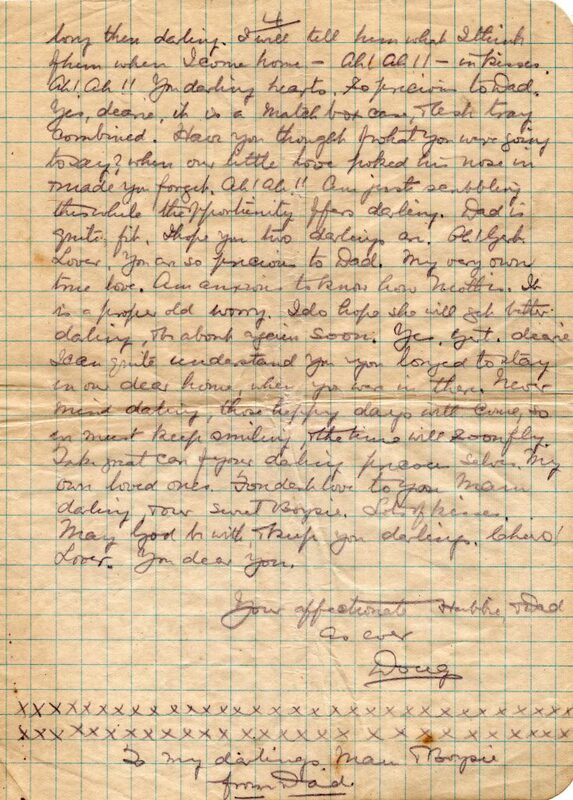 Doug Cavey’s last letter to his wife August 29th, 1917, page three. 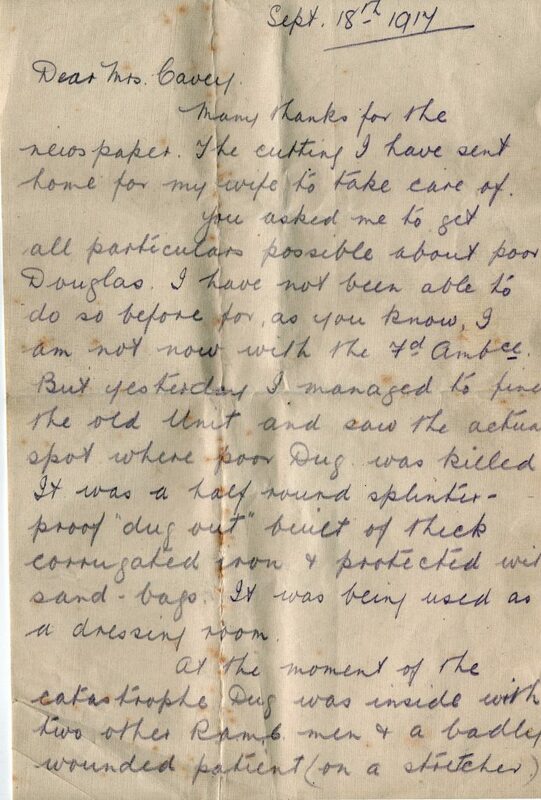 Doug Cavey’s last letter to his wife August 29th, 1917, page four. 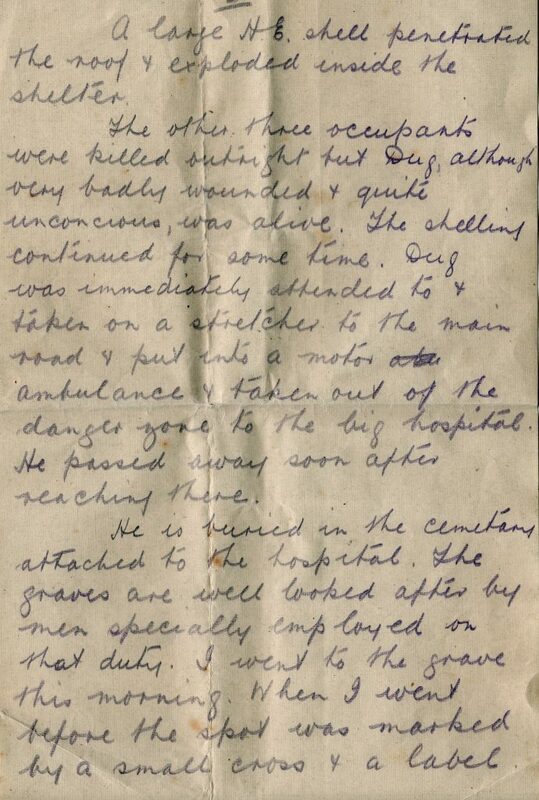 He was a sergeant serving with the 9th Field Ambulance with the Guards Division when he was struck by shrapnel from a nearby shell burst whilst helping to clear battlefield causalities in France just the following day after writing this letter on August 30th, 1917. 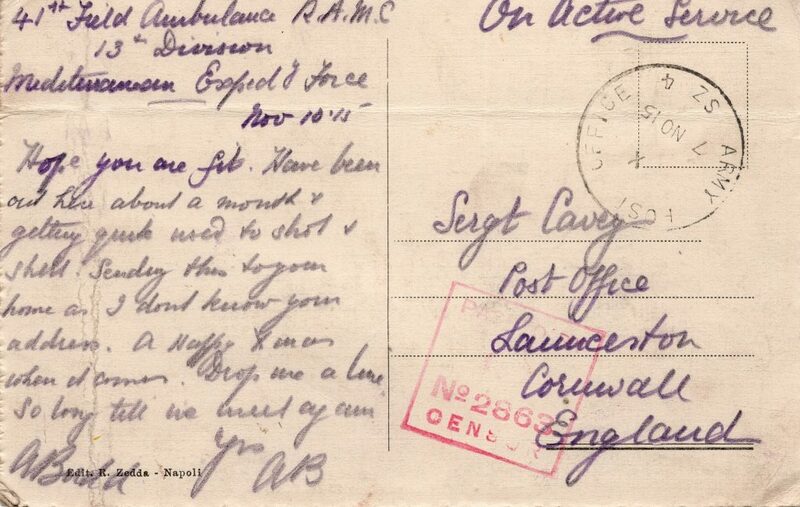 He died of his wounds the same day at Canada Farm Dressing Station. 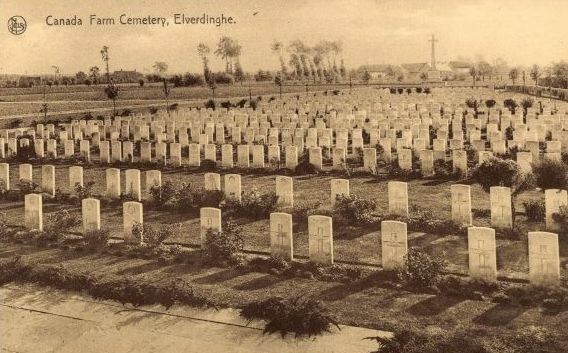 He was interred at Canada Farm Cemetery, Elverdinghe, Belgium, II. G. 14. 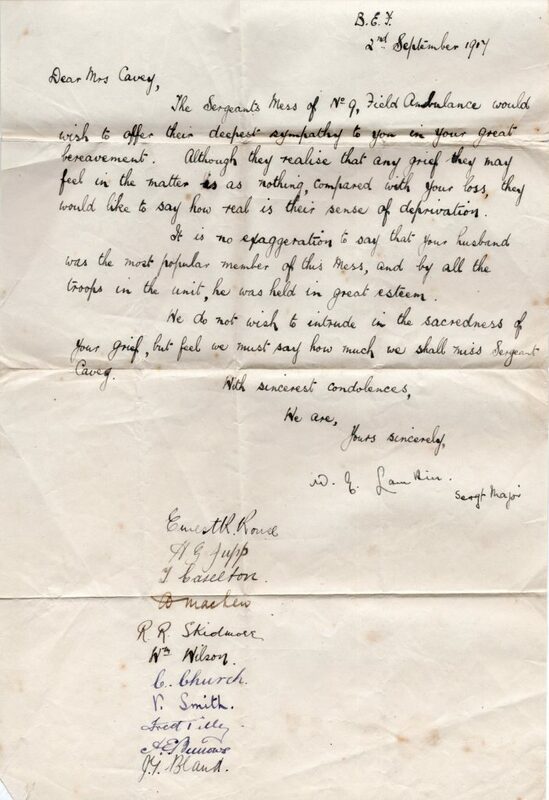 Letter from the Sergeants Mess September 2nd, 1917. 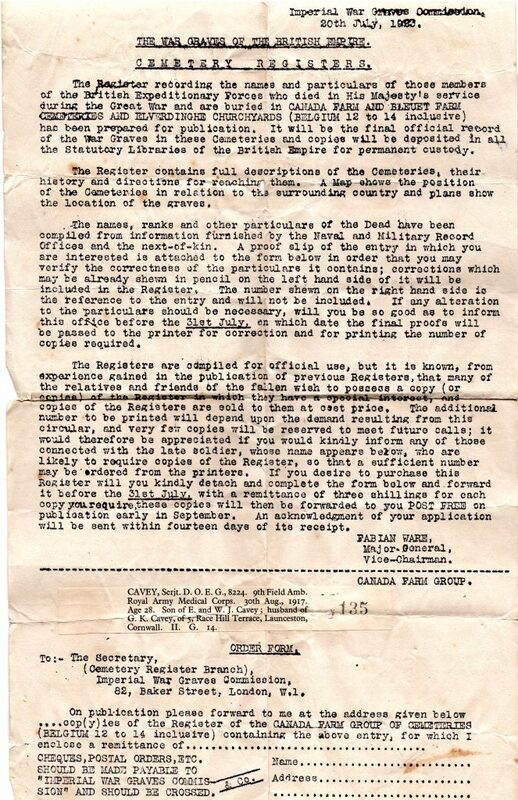 Doug Cavey Official Death Announcement September 10th, 1917. 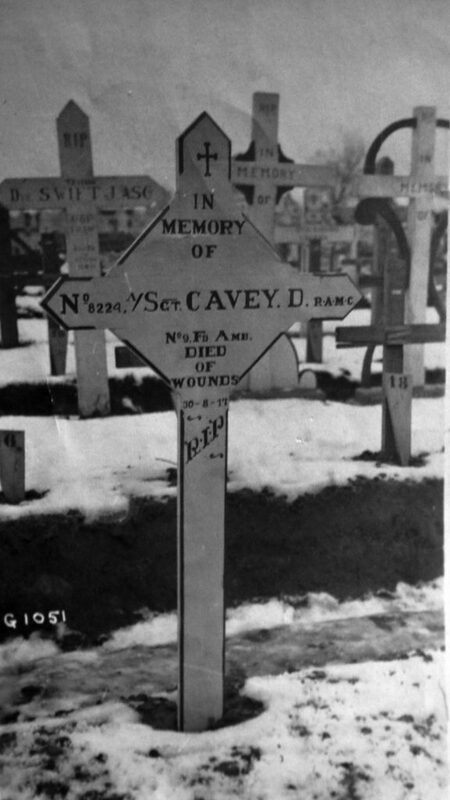 Doug Cavey Death Announcement September 10th, 1917. 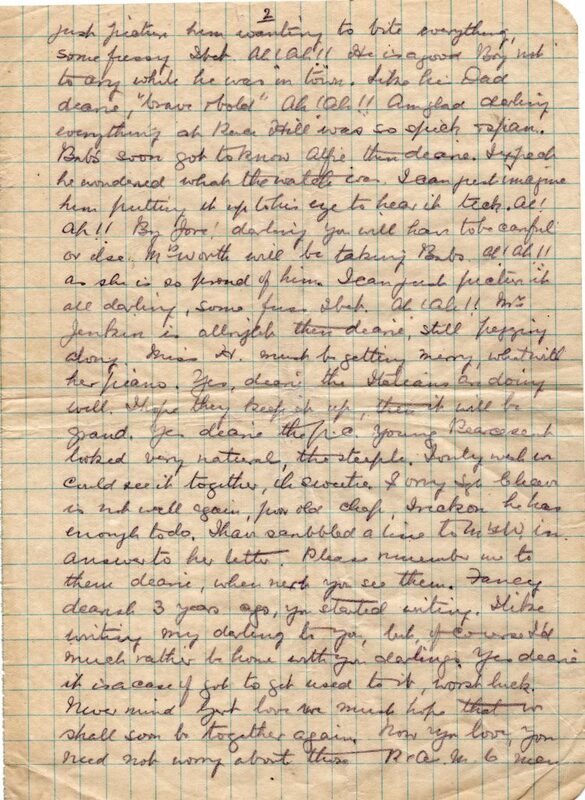 A. J. Boyd’s letter to Mrs Cavey September 18th, 1917, Page 1. 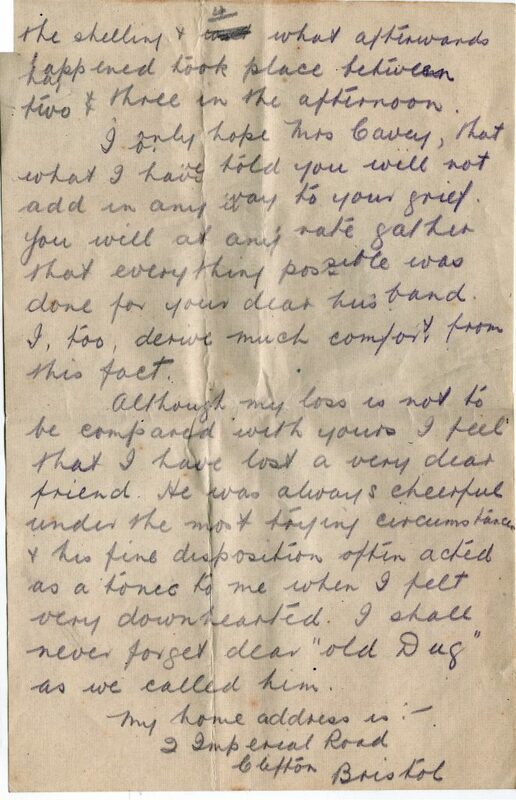 A. J. Boyd’s letter to Mrs Cavey September 18th, 1917, Page 2. 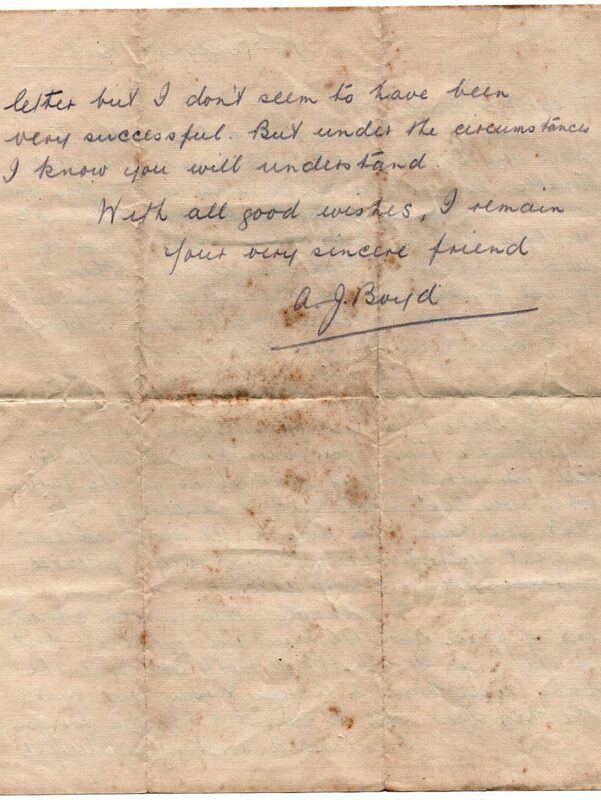 A. J. Boyd’s letter to Mrs Cavey September 18th, 1917, Page 3. 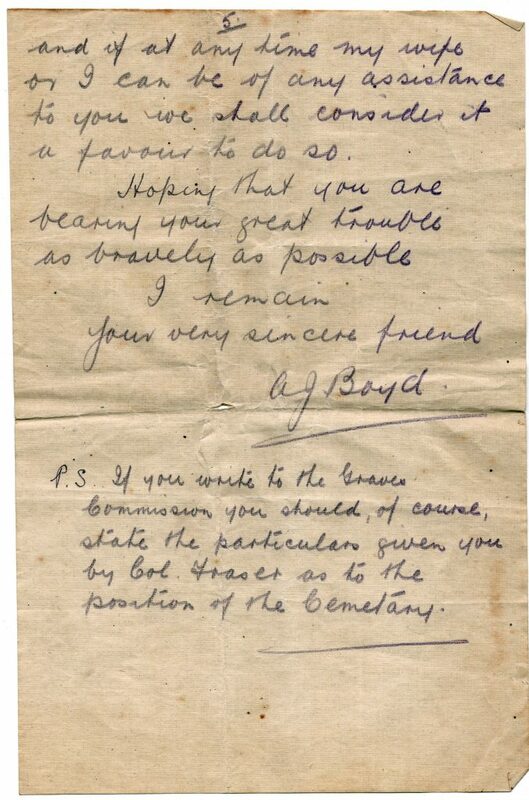 A. J. Boyd’s letter to Mrs Cavey September 18th, 1917, Page 4. Many thanks for the newspaper. The cutting I have sent home for my wife to take care of. 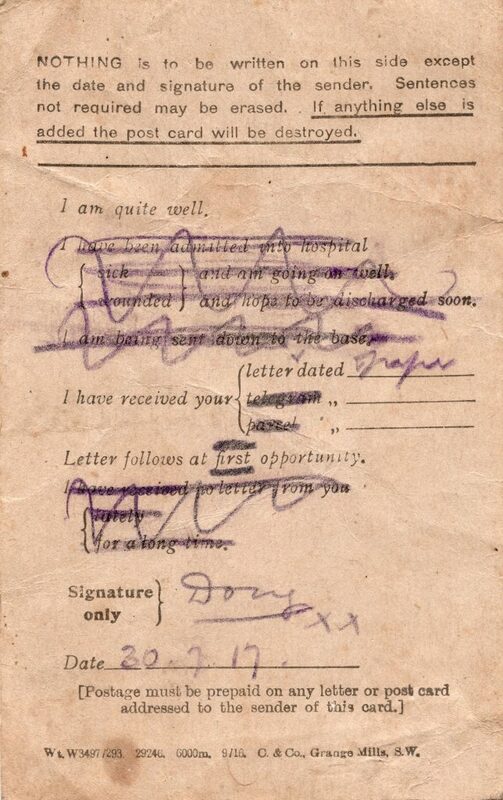 You asked me to get all particulars possible about poor Douglas. 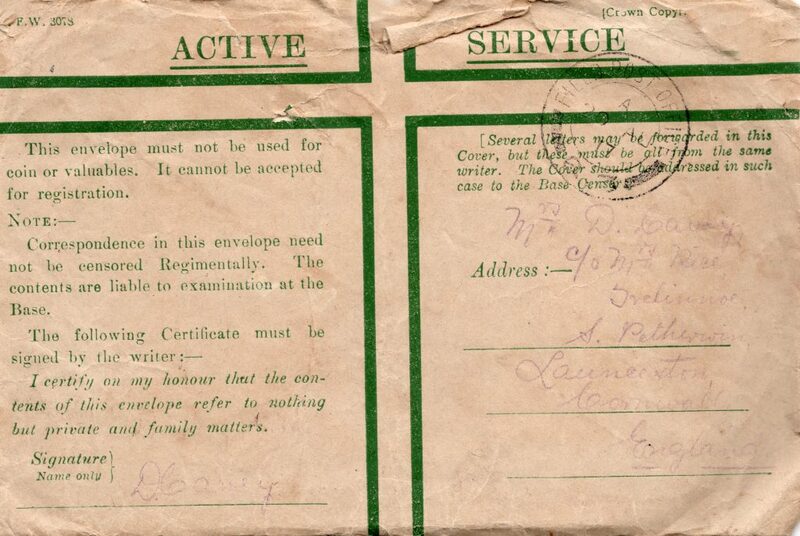 I have not been able to do so before for, as you know I am not now with the 7th Field Ambulance. But yesterday I managed to find the old Unit and saw the action spot where poor Doug was killed. 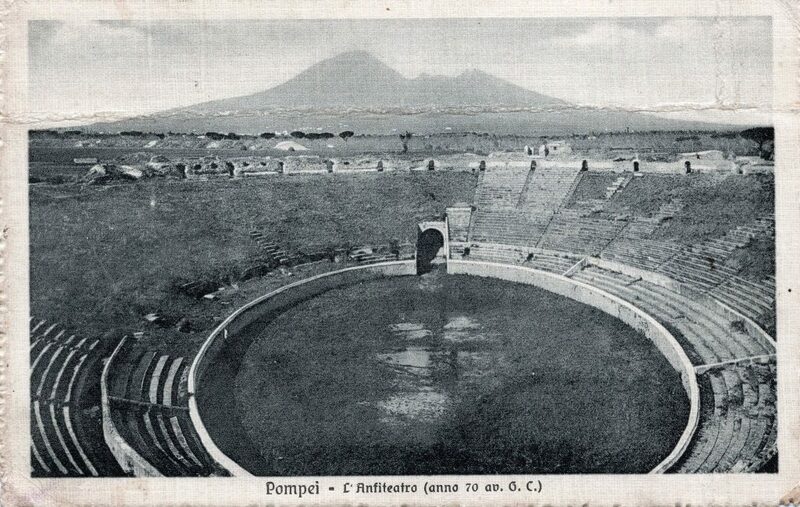 It was a half round splinter-proof ‘dug out’ built of thick corrugated iron and protected with sand-bags. It was being used as a dressing room. At the moment of the catastrophe, Doug was inside with two other R.A.B.C. men and a badly wounded patient (on a stretcher). A large H.E. shell penetrated the roof and exploded inside the shelter. The other three occupants were killed outright but Doug, although very badly wounded and quite unconcious, was alive. The shelling continued for some time. Doug was immediately attended to and taken on a stretcher to the main road and put into a motor ambulance and taken out of the danger zone to the big hospital. He passed away soon after reaching there. 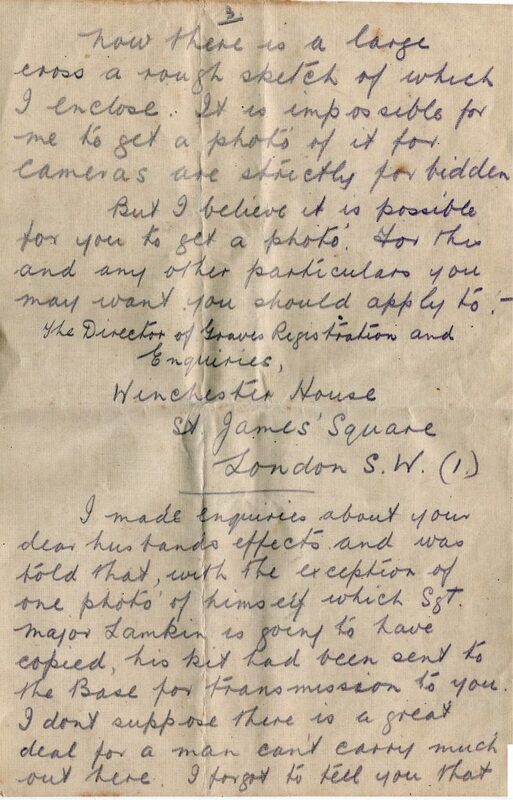 I made enquiries about your dear husbands effects and was told that, with the exception of one photo of himself which Sgt. Major Lamkin is going to have copied, his kit had been sent to the Base for transmission to you. I don’t suppose there is a great deal for a man can’t carry much out here. 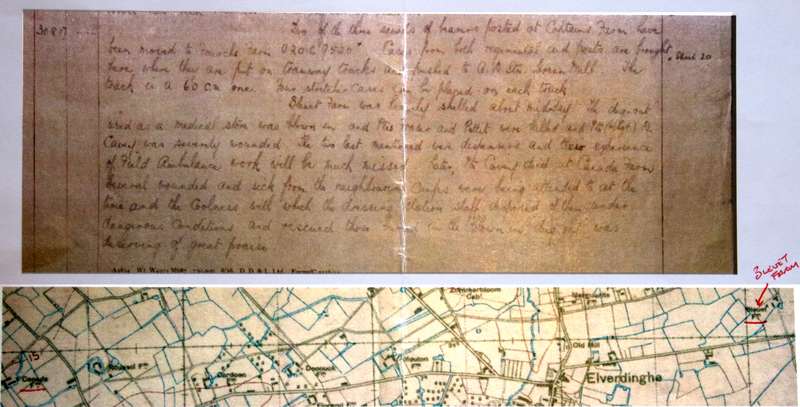 I forgot to tell you that the shelling and what afterwards happened took place between two and three in the afternoon. I only hope Mrs Cavey, that what I have told you will not add in any way to your grief. You will at any rate gather that everything possible was done for your dear husband. I, too, derive much comfort from this fact. Although my loss is not to be compared with yours I feel that I have lost a very dear friend. He was always cheerful under the most trying circumstances and his fine disposition often acted as a tonic to me when I felt very downhearted. I shall never forget dear “old Dug” as we called him. 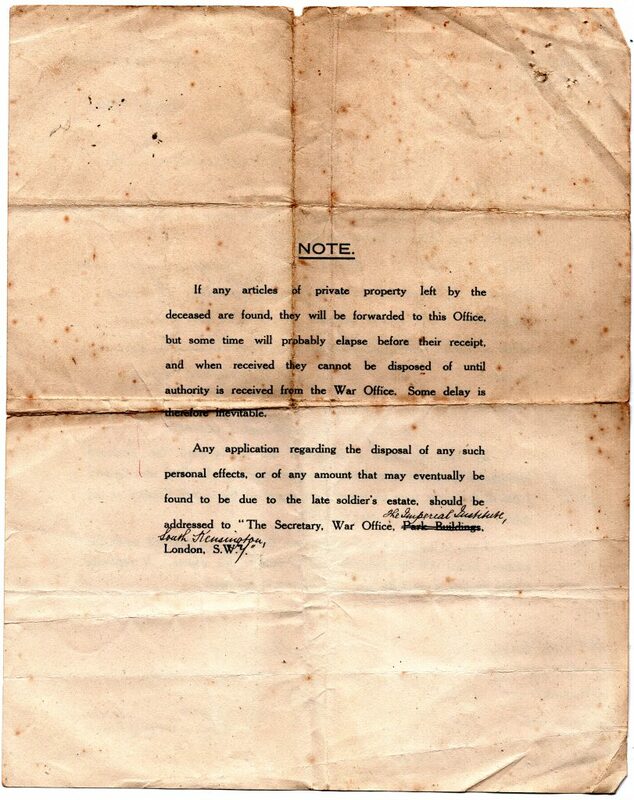 My home address is:- 2 Imperial Road, Clifton, Bristol, and if at any time my wife or I can be of any assistance to you we shall consider it a favour to do so. Hoping that you are bearing your great trouble as bravely as possible. I remain your very sincere friend, A. J. Boyd. 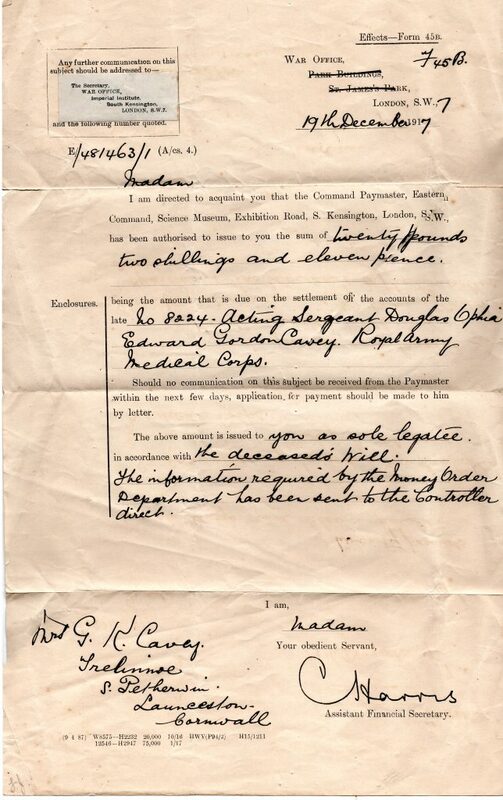 Doug Cavey’s effects notification December 19th, 1917. 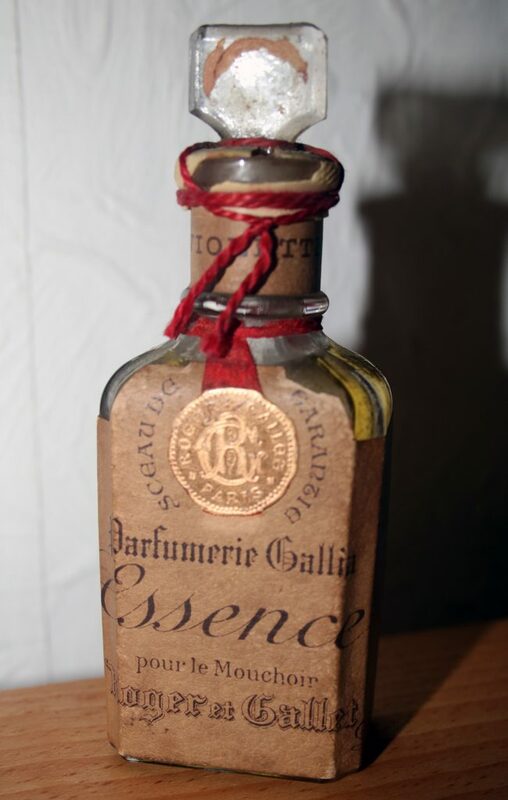 The one item that was found amongst Douglas’s effects, was this bottle of perfume, intended to be a present to his wife Gertrude on his return home. He never got to personally hand it to her, and on receiving the bottle with his effects, she could never summon the desire to use the perfume, preferring to keep the bottle secured. Doug Cavey’s Perfume Gift for his wife. 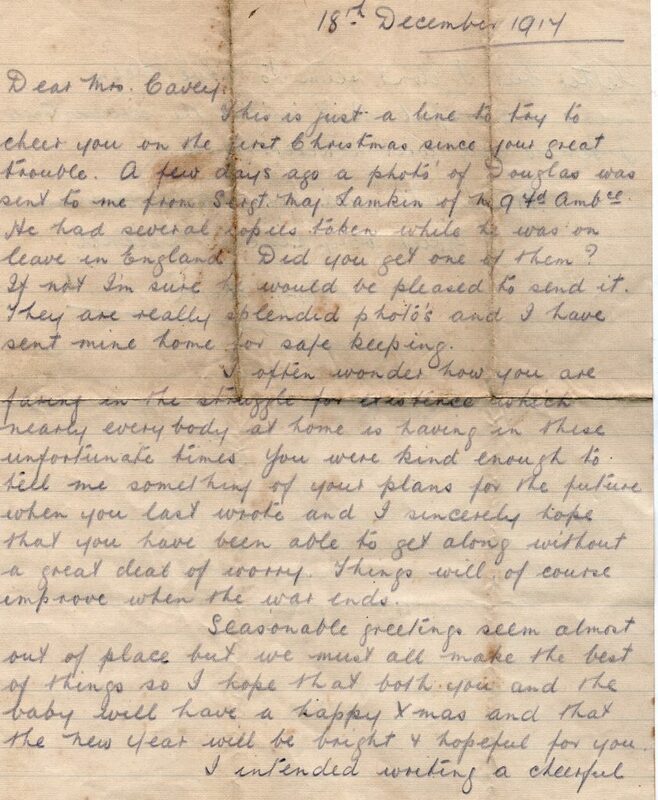 A. J. Boyd’s Letter to Mrs Cavey December 18th, 1917, Page one. 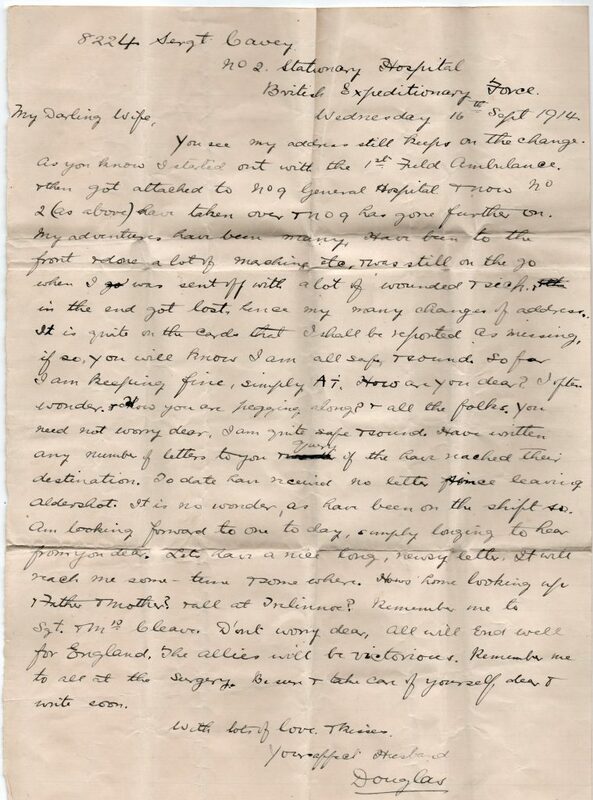 A. J. Boyd’s Letter to Mrs Cavey December 18th, 1917, Page two. This is just a line to try to cheer you on the first Christmas since your great trouble. A few days ago a photo of Douglas was sent to me from Sergt. 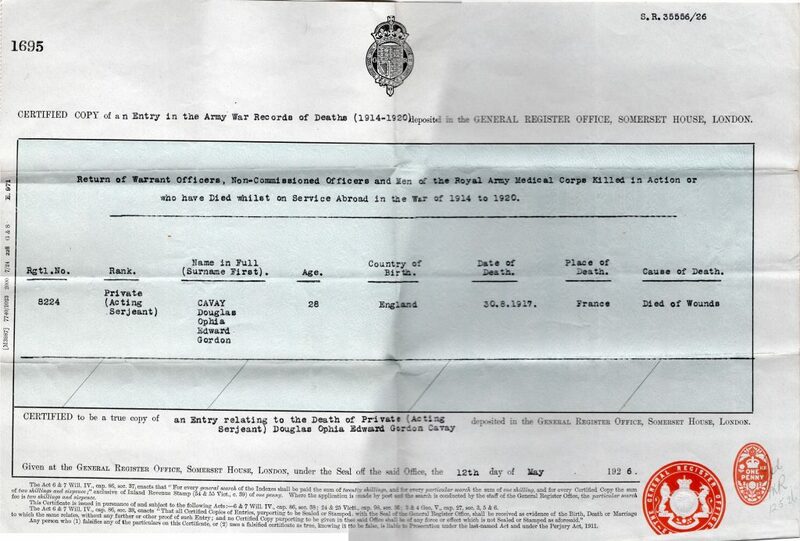 Major Lamkin of the 9th Field Ambulance. He had several copies taken while he was on leave in England. Did you get one of them? 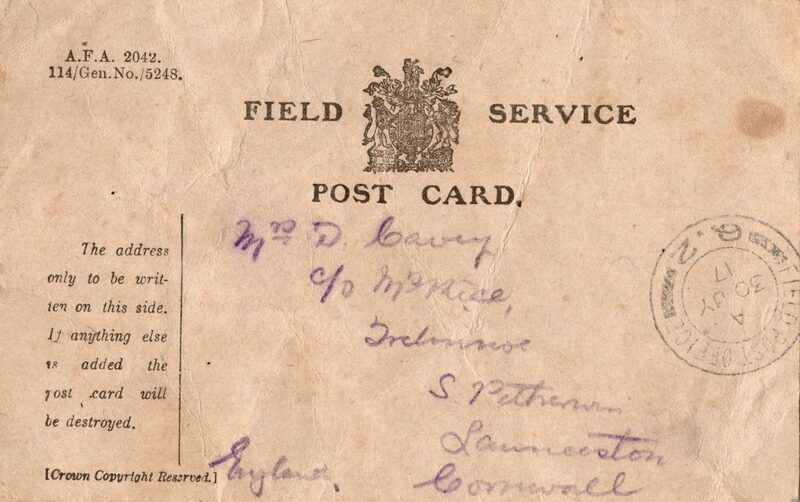 If not I’m sure he would be pleased to send it. 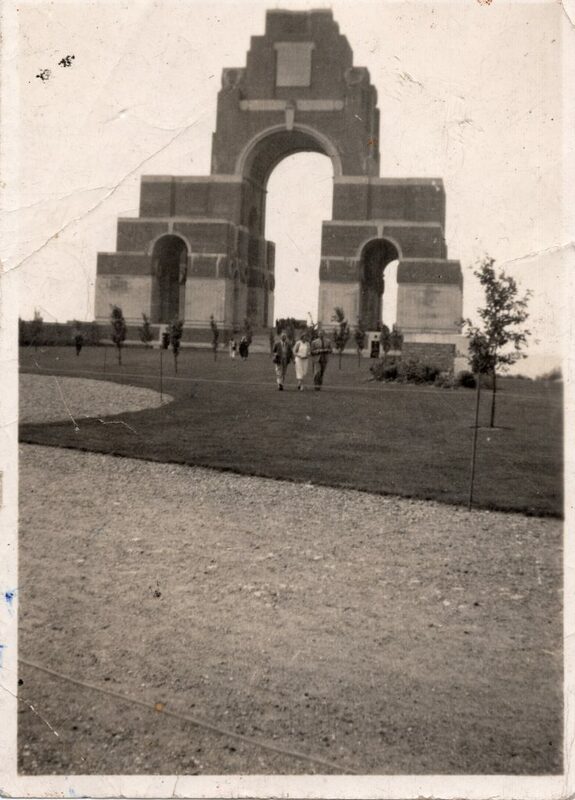 They are really splendid photo’s and I have sent mine home for safe keeping. I often wonder how your are faring in the struggle for existence which nearly everybody at home is having in these unfortunate times. You were kind enough to tell me something of your plans for the future when you last wrote and I sincerely hope that you have been able to get along without a great deal of worry. Things will of course improve when the war ends. 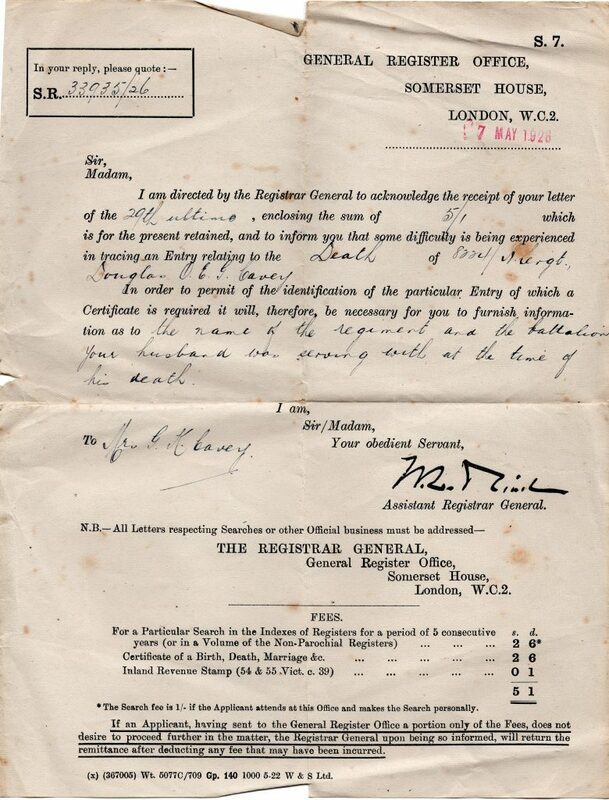 Douglas Cavey’s Death Certificate, May 12th, 1926. Gertrude Cavey photographed by Douglas’s grave on the 20th anniversary of his death in August 1937. 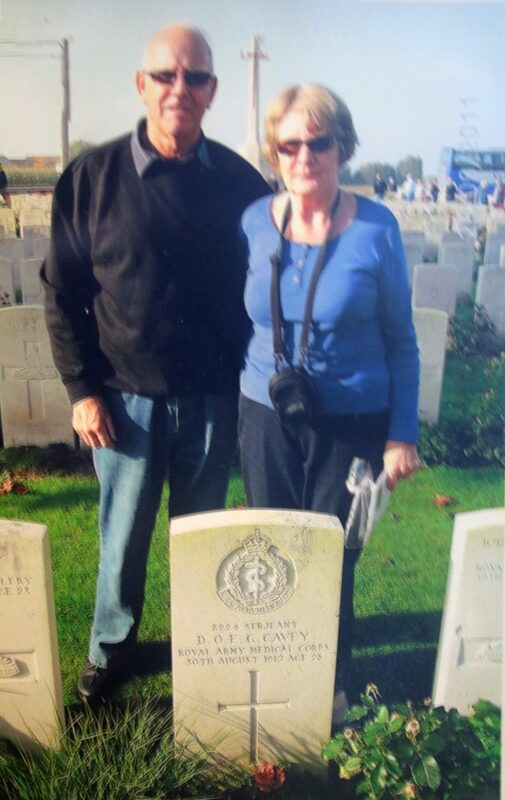 Richard and Jean Cavey Visiting Douglas Cavey’s Grave. 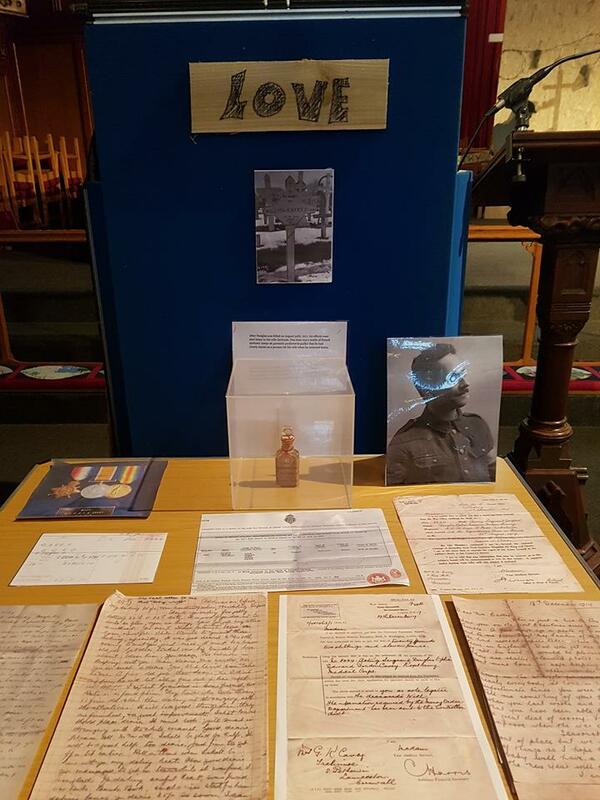 Doug Cavey’s Display at Launceston WW1 100 November 2018.